Okay, so its not loads more helicopters. In fact, two: the CH-67 Huron and the Mi-290 Taru. In addition to that, there's a new showcase and some time trials. The DLC costs £11 / $16. Perhaps more interesting are the free additions being made to the base game. 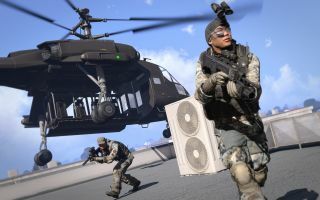 Accompanying Helicopters is a platform update that adds a new multiplayer mode, helicopter VR training, and optional alternative flight dynamics. These extras are being made available to all Arma 3 players, regardless of whether they buy the Helicopters DLC.